this season of dryness, gets frustrating. will bear fruit when the time is right. The important thing is to be consistent and just to put in the time. Maybe there's something to learn from the disciples' experience. to haul their nets up, they did, with good results. strength to do so; in training and preparing for the right time, the right moment. Growing up in Singapore, I often heard Indian hawkers speaking in Chinese dialects, or Chinese hawkers touting their wares in Malay. I love the fusion that ensues in multi-cultural Singapore. Even here in Los Angeles, I've picked up a couple of choice greetings in Spanish, I've acquired a taste for tamales and tacos, buy pastries from a Iranian pastry shop, and have a bowl of Japanese Ramen noodles every now and then. And the list of shops read like a United Nations of Food : Sang Kee Peking Duck, Spatoro's Cheesesteak, Lancaster County Dairy, Dutch Eating place, Kamal's Middle Easter Specialities, Profi's Creperia, Nanee's Kitchen (Indian Food), Little Thai Market, Le Bus Bakery. I wandered and let myself be led where my senses took me and ended up in a spice shop where I found Sweet Hungarian Paprika, Turkish Apricots, Garam Masala, Apple Pie Spice, Taco Seasoning, Agar-Agar Powder (swallow Globe Brand), Worcestershire Sauce, African Red Pepper Mombosa, Japanese Sakura Cherry Blossoms, Sulawesi Toraja, all sitting together comfortably on the shelves. This would be the ideal world, of shared food, shared smiles, all cultures and people in one nice warm brickhouse, coming together for food, conversation, commerce and laughter. 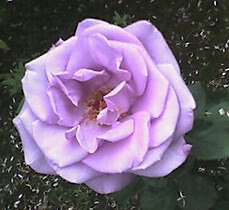 but to the artist that directs it that it owes the beauty that it bears. As to the brush, it couldn't take glory in the masterpiece that it has made. It knows that artists aren't inconvenienced : They make child's play of difficulties, taking pleasure in sometimes choosing instruments that are weak and defective..."
- St. Therese of Liseux. I'm really enjoying St. Therese's autobiography, 'The Story of a Soul'. I love her child-like nature, her metaphors, full of richness. who knows how to make use of us in the best way possible. and which work to enhance the Master's artistry. We were not bought cheaply. His pain...His sufferings, His cross...His death. We are the most exquisite instruments that even money cannot buy. He wanted us, so much so that He paid the ultimate price. And so it goes, we are instruments that are powerfully made. a part of His symphony. Each of us, a one-of-a-kind creation. Perhaps that's the way it is with us. to burn an intense fire within us. 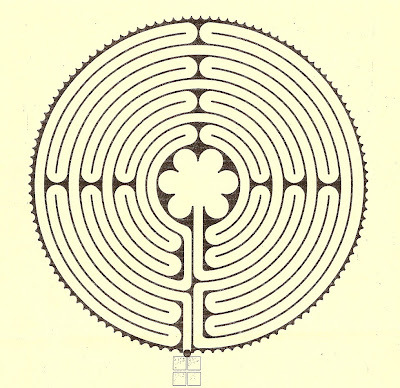 us to lose our way; Labyrinths are meant to help us find it. leads out. The path is not linear (ie., it does not move from the outer path of the circle directly toward the inner path of the circle). Rather, at times when we are the closest to the center on the path, we may actually be farthest from the center distance-wise." "God of life, there are days when the burdens we carry chafe our shoulders and wear us down; when the road seems dreary and endless, the skies gray and threatening; when our lives have no music in them and our hearts are lonely, and our souls have lost their courage. Flood the path with light, we beseech you; turn our eyes to where the skies are full of promise,"
and it brought me much comfort and peace. Two big Labyrinths painted on fabric were laid out in the church hall, and the hall was softly lit by candlelight. One by one, we were sent into the Labyrinth, to walk along the narrow, winding pathways, the twists and turns, the very metaphor of our life's journey, laid out in cloth beneath my feet. There were people ahead of me and behind me, all at different stages, around different turns, all walking the same path. I was suddenly embraced by the memory of myself as a toddler, reaching up and taking my dad's hand in the midst of a crowded shopping centre. It was a memory from so long ago, but it brought back that same feeling of being safe and protected and comforted. Just by holding on to that hand, I knew that I would be guided to safety. And my eyes welled with tears. I am never alone on this path. His hand is ever by my side. his big hand. And just like a parent holds the hand of a stumbling toddler and walks along with him, I know that He will never let go of me, unless I struggle to let go of His hand. I may fall, I may stumble, but His ever loving gaze is always upon me. He is ever present by my side. 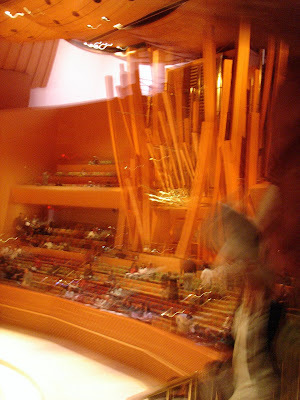 I was delighted to finally catch a concert at the Frank Gehry designed Walt Disney Concert Hall the other day when my good friend Dan invited me to catch a piano concert by celebrated pianist Alfred Brendel. built-in organ on one end of the hall. Schumann pieces that were scheduled for the concert programme that night. He made that piano sing. a thought came to mind. but silent and unplayed, collecting dust in some hall. If God is the pianist and we are his keys, ("Ebony and Ivory, live together in perfect harmony,side by side on my piano keyboard, oh Lord, why don't we? "- Stevie Wonder), then how beautiful we sound when we are all playing the notes of a wonderful chord together, in harmony. How beautiful the sound of an instrument that yields to a masterful touch,where the keys are smooth, and don't stick or obstruct the fingers of the artist in any way. How beautiful the song that is played, when the artistry of the master is facilitated by an instrument that doesn't hinder the artistry in any way, but sings fully with all the resonance with which it was made to sing. making the piano sometimes weep, and sometimes shout with joy. Our lives, our histories are like songs. Like sonatas. breathe with beautiful colour and contrast. nothing stays the same for too long. we have no clue as to how the whole piece will play out. as how only God knows it will be.